Scouting offers fun, challenge and everyday adventure to more than 400,000 girls and boys across the UK! Offering over 200 different activities, Scouting helps 5 & 1/2 - 25 year olds grow in confidence, achieve their full potential and become active members of their communities. What do volunteers do ? This everyday adventure is possible thanks to our adult volunteers, who support Scouts in a wide range of roles from working directly with young people, to helping manage a Group, to being a charity Trustee. There is a role for you, whatever skills you may have! We help volunteers get the most out of their experiences at Scouts by providing opportunities for adventure, training, fun and friendship. Contact us to find our more! 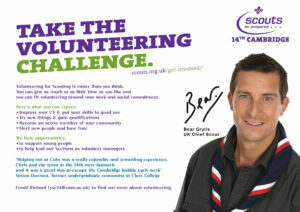 Our award-winning training scheme for volunteers means that adults get as much from Scouts as young people. Our approach focuses on what you want to get out of volunteering with Scouts, while respecting how much time you can offer. Over 90% of Scout volunteers say that their skills and experiences have been useful in their work or personal life. Flexible volunteering means that you can give as much time as you want and have a great time with us!